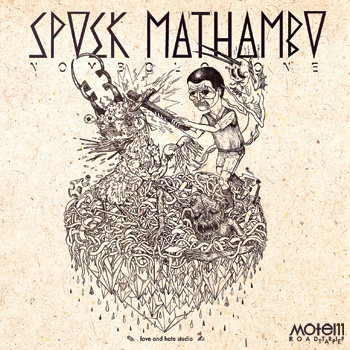 Like already announced a week ago, Spoek Mathamo’s latest project “Nombolo One” was released, yesterday. On this Release, Spoek Mathambo pays tribute to classic south african songs from the 70s to the 00s, by such great artists as Brenda Fassie, Letta Mbuli, Caiphus Semenya, BOP, Jack Knife, Chiskop, Sankomota, Mahlathini… just to name a few! The digital Version of the Release is available on Motel11’s Bandcamp page. Get this amazing piece of music, now! The price is up to you, you can decide yourself what to pay for! You can also pre-order the strictly limited physical Version of the Project, now, for only 17€! Just 100 copies available! The CD will be dilvered in a nice wooden Box. You can order it from the bandcamp page, too! And make sure you’ll check out the Limited Spoek Mathambo merch Denim Jackets, available in 10 different colours and limited to 50 pieces, designed by the dynamic Cape Town based art collective “Love and Hate Studio”!